For not being overly crazy about chocolate I seem to have my fair share of chocolate based recipes here on food to glow. But I must say that this is my favourite. I think what I like – other than the knockout taste – is that it is a recipe that has basically haunted me until I made it. I tore the original recipe from a newspaper years ago – sans credit – and it has managed to survive the many remorseless purges of such scraps of paper that I have squirreled away around the kitchen, and in various untidy woven baskets. It even has smears from other recipes that I have made, such has been its proximity to the tried and tested. When finally I made this cake I was left wondering what other masterpiece, genius-type gems I have condemned to the recycling bin over the years. I shan’t ponder that for too long. I don’t want to know. So, my tip for you dear reader is to find a wee spare moment over the holiday and lovingly (not ruthlessly) peruse your torn out bits from magazine and newspapers, lying unloved in a heap, or perhaps in a tidy but ignored file. 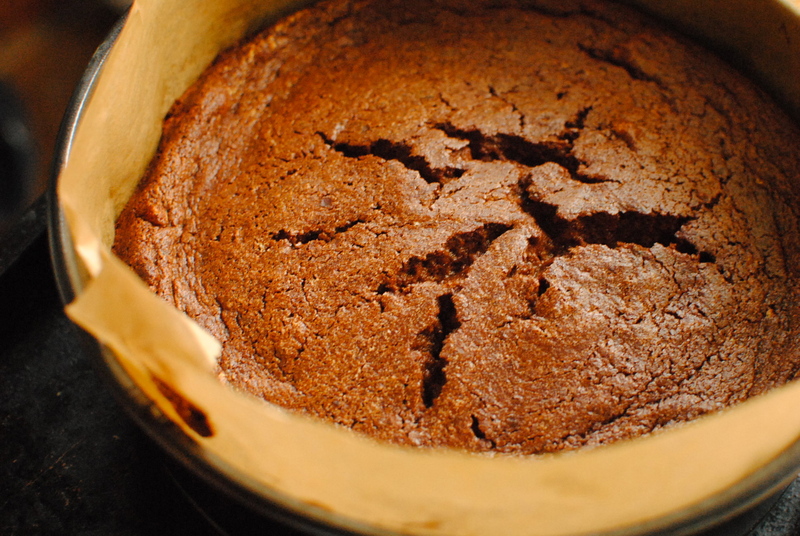 I bet you will find your own chocolate chestnut cake in there somewhere. If you know what I mean. Btw, my blini page has been taking quite a hit lately (I think it is one of my top posts right now) so if you are wanting a homemade blini recipe and ideas on how to top them, here’s the direct link. It’s dead easy and quite fun to do. And the great thing is that you can make the un-topped blinis ahead of time and stash them – non-stick paper dividing the layers – in the freezer for use any time. 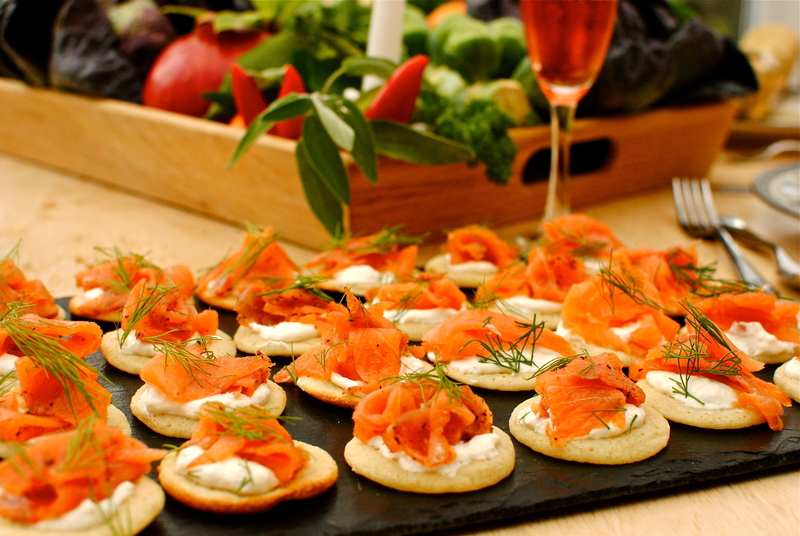 We will have them late on Christmas morning when our family has arrived, topped with Scottish smoked salmon, horseradish-laced creme fraiche, dill fronds and a squeeze of lemon. Perfect with Champagne. I’m popping this over to Karen at Lavender and Lovage who is hosting this month’s Simple and in Season on behalf of Ren at Fabulicious Food. Lots of gorgeous ideas already over there. 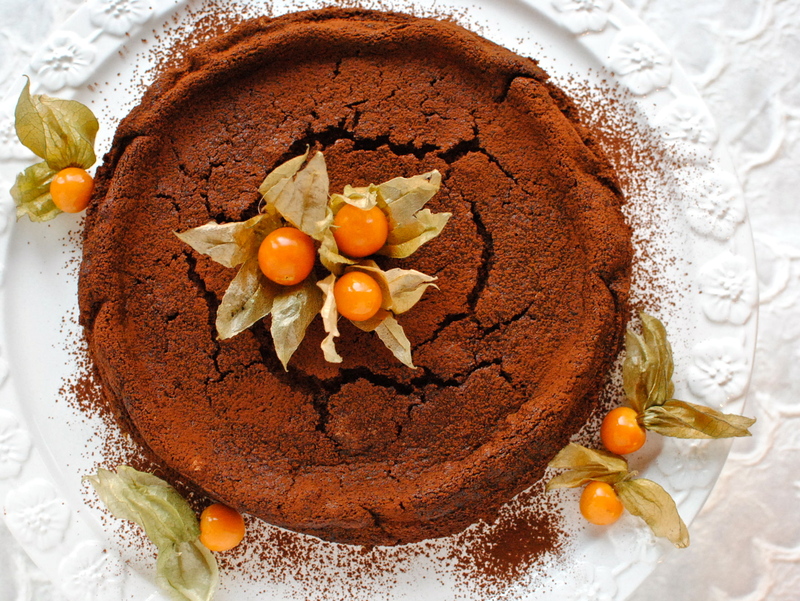 History of this cake: This recipe is inspired by one I tore out of a newspaper many years ago. It has survived changes of location – under a pile of magazines, as a bookmark, and finally to the top of the ‘must try’ heap in a tatty folder (please someone, come organise me!). Despite regular and ruthless weeding out of random recipes, I’ve probably had the original of this recipe about five years. I made it for the first time last month and I was very impressed with how well chestnuts and dark chocolate complemented one another. Of course I have played around with the original but I do wish I knew whom to thank for the heads up on the chestnuts, because it’s a keeper. Much less calories and fat than ground almonds but just as delightful for use in a flourless cake. About the cake: When biting into this cake as it has just cooled, it is very moussey – like biting into a very delicious cloud. Leave it to chill for a few hours, or overnight, and it takes on a decidedly truffle-like texture. Heavenly both ways, I think. And not much added fat or sugar compared to other such cakes. Here, replacing some of the butter and sugar, I have asked you to soak and whiz up some prunes. But you can keep it all butter (125 grams) if you don’t want to bother with that. It is Christmas after all. I have tried it both ways and it works perfectly either way. 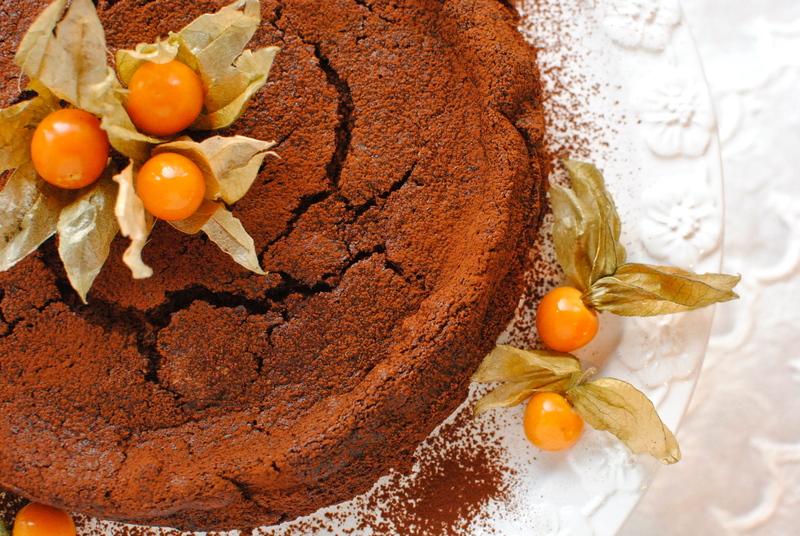 Despite its healthy makeover, including subbing chestnuts for flour, this is a very rich cake. So a small slice will probably do for even the most passionate chocoholic. Dust with cocoa and top with physallis as I have done, or how about a mix of cocoa and icing sugar and some gorgeous ruby redcurrants? Or even slices of candied orange. Serve always with a healthy scoop of tangy crème fraiche or Tofutti. Heavenly. Preparation: Preheat the oven to 170C/375F. You will need a 20 cm – 23 cm springform cake pan – or tin with a removable base – oiled/buttered and lined with baking paper (see below). I like a springform pan for this. I used a 23 cm one in some of the images you see here, and that worked fine for the timing and texture. Twenty centimetres is a more usual size. I cut my non-stick base paper a centimentre wider than the tin and notch it so it fits a bit up the sides, buttering the facing side. I then measure the outside of the tin and cut it so that it is as deep as the tin, notching it on one long side to also fit into the bottom of the tin, so that it overlaps the base paper and clings to the butter. You may find it handy to use a metal paper clip to hold it in place. Or, you could just do it how you like! 1. First of all soak the prunes in enough just-boiled water to cover, and leave for 10 minutes. Drain the prunes and whiz them up with a blender stick or equivalent. Or chop very, very finely and mash. Set aside. 2. Break the chocolate up and place the pieces with the butter in a glass bowl, or top of a double boiler pan. Sit it over a pan of just boiled water without it touching the water and let it melt. No need for you to turn on the heat. Chocolate and butter melt at body temperature so just the hot water will melt both in about five minutes or so. Stir and set aside. 3. While the chocolate and butter are melting beat the chestnut puree and the milk in a bowl until the chestnuts are very smooth, mixing in the prunes and the vanilla once it is smooth. I find a measuring jug helps to contain the mixture while initially mixing it. 4. In a scrupulously clean bowl whisk the eggs until stiff peaks just begin to form. Set aside. 5. Almost there! In a large bowl, whisk together the egg yolks and the coconut palm sugar or caster sugar until they are thick and pale. 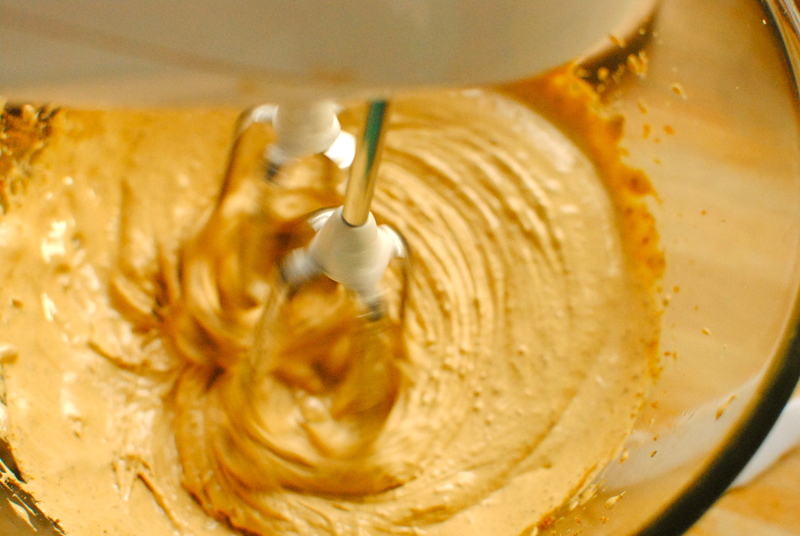 Now whisk in the chestnut milk to make a smooth batter. Pour in the chocolate and butter mix and stir until well combined. Now, using a large metal spoon fold one spoonful of egg white quickly into the mixture, to lighten it, before folding in the rest of the white. Don’t worry about a few little white puffy lumps as you don’t want to knock too much air out by mixing too hard. 6. Pour the mixture into the prepared tin and bake for 30-35 minutes, until the cake is starting to pull from the sides and the centre is still a bit wobbly and probably cracked. 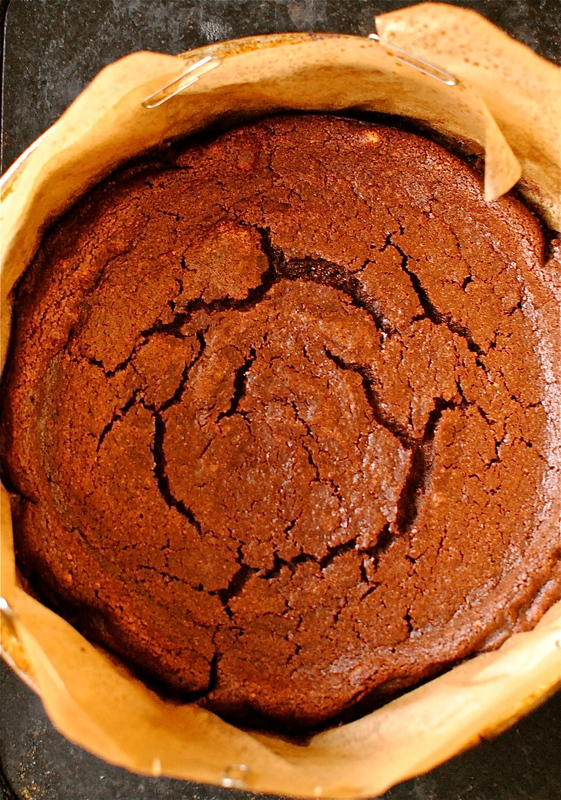 Once out of the oven the cake will settle and deflate a bit, the cracks may deepen and the centre will set. Leave it in the tin to go cold and set further. Only then should you carefully remove the outer ring of the tin. Carefully peel away the outer baking paper (you probably shouldn’t attempt to remove the bottom piece, just beware when serving that it is there) and trim any visible baking paper from the base paper. 7. Cover with clingfilm or a clean tea towel and chill for about four hours – or up to two days. 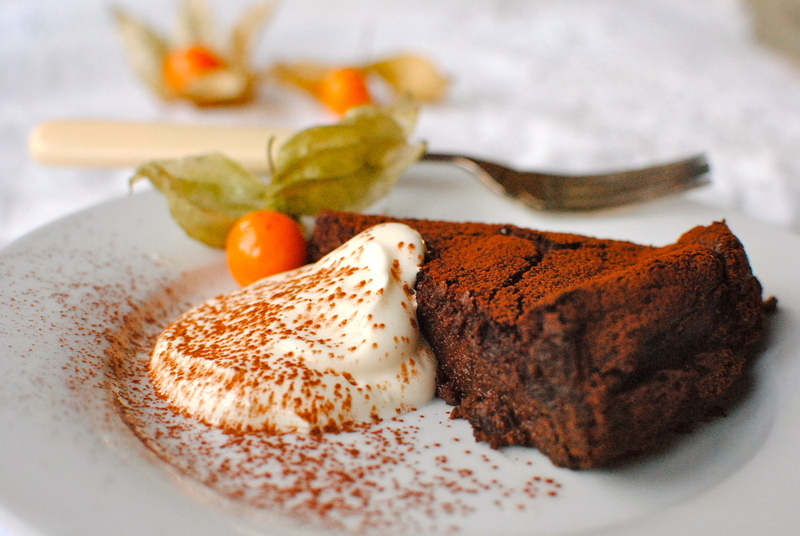 Serve generously dusted with cocoa powder, top with whatever you fancy and serve in thin wedges with crème fraiche. It’s a fab recipe and it’s exactly the the same as one I took from a newspaper/ magazine several years ago and it was by (drum role if you please) Hugh Fernley Whittingstall. Kelly this sounds so yummy & good can’t wait to try it – have a very happy Christmas & looking forward to even more great recipies in 2013 ! THanks so much Linda. You have a great holiday too. You in Morocco for Christmas? I really want to make/eat this! 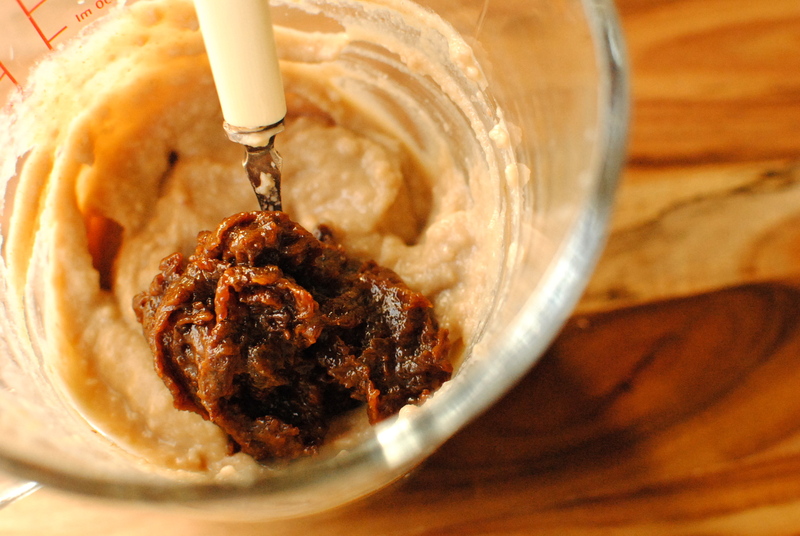 I have never heard of susbstituint part of the butter with prunes – what a great idea! Love the look of this cake – but then its chocolate, and dark chocolate on top of that – couldn’t be better 🙂 glad you kept the newspapper clipping! Yeah, that’s a trick that was popular sometime in the 90s I think, but was supplanted by fancy fake fats (ugh!). I have revived it for this recipe.I hope you keep all your clippings too! This is absolutely gorgeous! You have such great taste!! Why thank you. Very sweet of you to think so. I think some of my odder combos might test that statement though! Thanks Miss Lizzy! Have a super holiday. I keep looking at your posts to bask in the warmth of your spring/summer produce. So lush! Wow, this cake looks interesting! I’ve seen tins of chestnut paste here, but not whole chestnuts. Would that work in this recipe? I love anything with prunes in it, so I’m very curious to give this a try! Katie, I do use tinned chestnuts in the recipe, but for those who can’t get them I suggest whizzing up the cooked vacuum-packed ones. In the recipe I ask that you use the tinned and mix it with almond/dairy milk to slacken it, that’s all. Hope the recipe isn’t confusing people.I must look at how I’ve written it up. Safe travelling, my friend. Enjoy your visit. I did see that, but the tinned chestnuts here is a paste or puree, not whole tinned chestnuts. Is a paste what you’ve used? 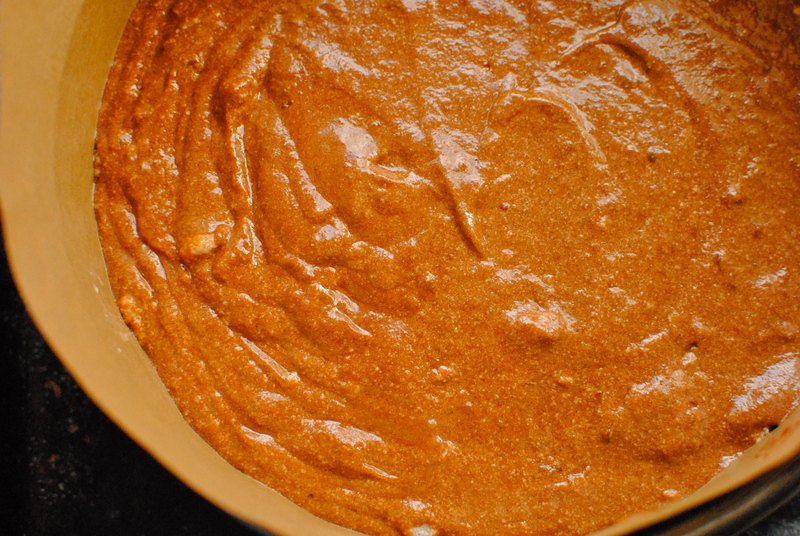 Yes, it is a paste already but you mix it with the milk to loosen it as it is very thick, more like canned pumpkin in texture. This is heavenly! I can have 2 slices because it’s a healthier cake 🙂 what a great idea to use chestnut in place of flour. must try this recipe soon. Thanks for sharing! What a chocolate lover’s delight! Thanks for sharing with us. I think I just gained 5 lbs. reading about it….LOL! 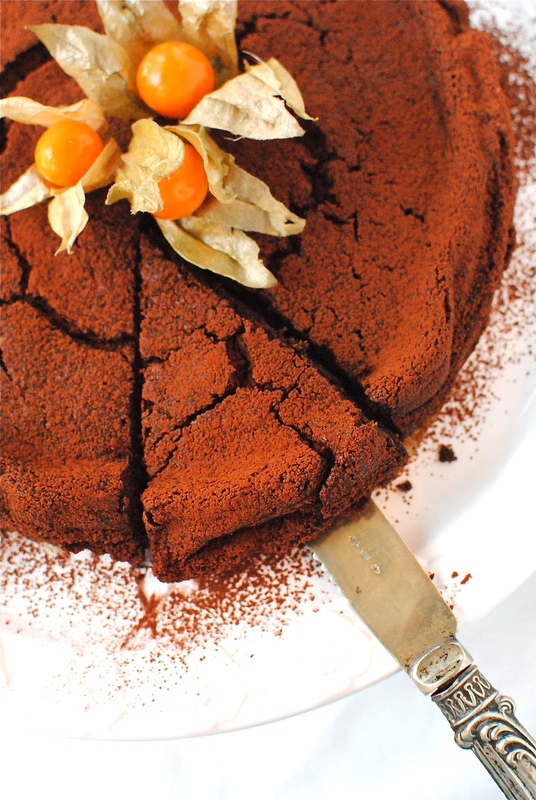 I love chocolate flourless cake. I may have to try this version. I use one for nearly every occasion that calls for a cake, my kids birthdays. What I like about it is that I don’t add any extra sugar other than the dark chocolate of course. 🙂 Plus I have a few friends that are paleo diet people (they do eat dairy though) and so it is a cake they can eat as well. I like the idea of chestnuts for this time of year. I would like a completely sugar-free version but I think most of my family would find that too, umm, challenging! But the chestnuts are a great sub that I will use in other cakes too, and brownies. Have a great holiday season with your family. What a stunning holiday cake! Time to bring out our best chocolate to share with family and friends, Happy Holidays! Hi Deb, and thank you 😀 I hope you have a fab festive time too. Here’s to holidays! Thank you Karen. 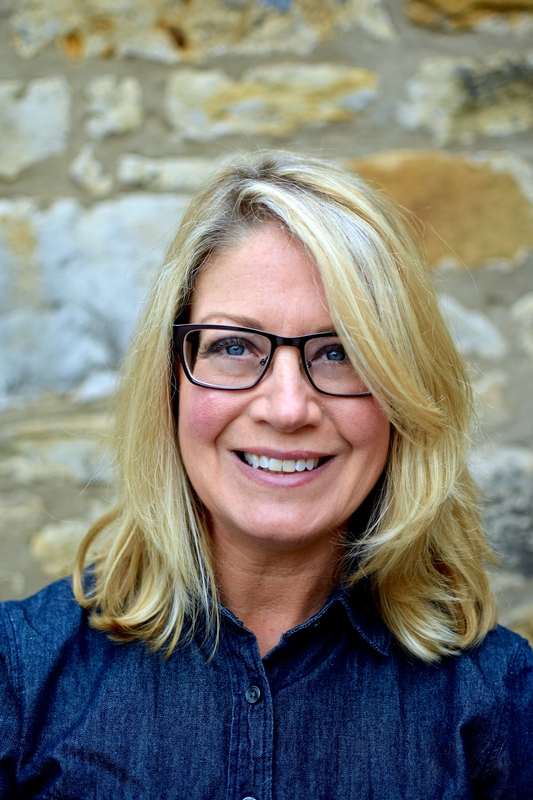 It was super to meet you earlier this year and to feel like I got to know you more every day through your inspirational and always fascinating blog. I always know who to look to for 5:2 ideas and – conversely – baking! All the very best for a fabulous 2013. Wishing you success and happiness in all that you do. I’m late to the party with this one – will have to save for next Christmas. This recipe is a Paleo friendly treat so I’m glad to have discovered it! Yes, it is Paleo isn’t it. Hadn’t thought it at the time. I should retag it! Hi Kellie. I have a tin of prunes lurking in the back of my cupboard. Is it possible to use these drained instead of the dried ones? Love choc cake but need to disguise the prunes for my 22 year old daughter! Good question. It should be fine but just drain them well so it doesn’t affect the rise of the cake. Let me know how it goes and if it’s good then I can give tinned prunes as an alternative. Good luck with the disguise! Love the recipe but what temperature is the oven?!? I’ve got everything set up to make, have I missed that bit? 170C/375F. Thanks for alerting me. That was written back when I wasn’t always being careful with the editing! I hope you enjoy it! Reblogged this on Her Insecurites. Sounds great! Do you think it would withstand making in advance & freezing? ?